Caption Jaime Martinez has been a professional dance artist and teacher for over 15 years. 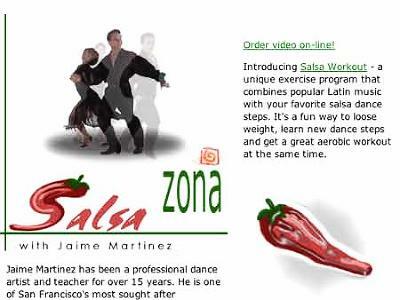 He is one of San Francisco's most sought after instructors. Jaime Martinez is a Certified Aerobic Instructor from CSU-Hayward a member of International Dance Excersize Association and Aerobics and Fitness Association of America. He is the designer and owner of Latin American Workout headquartered in San Francisco CA. Jaime conducts master classes and training workshops throughout the United States Central America and Europe. He has also founded and directs Pan American Dance Company which offers a full repertoire of dance entertainment popular modern folkloric ballroom and extravaganza performances.